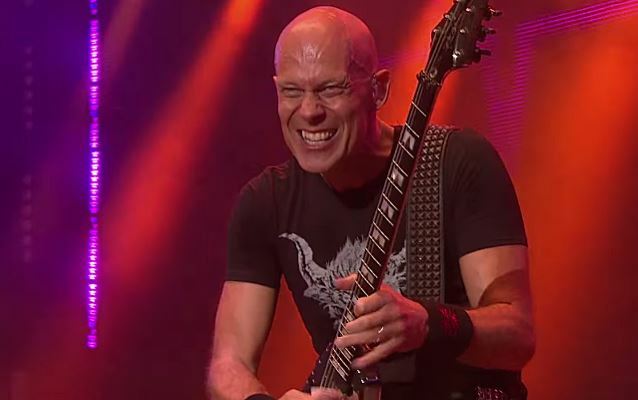 Metal Wani editor in chief Owais "Vitek" Nabi recently conducted an interview with guitarist Wolf Hoffmann of German/American metallers ACCEPT. You can now listen to the chat in the YouTube clip below. A couple of excerpts follow (transcribed by BLABBERMOUTH.NET). Wolf: "[It's coming together] a little bit slow, but we're getting into it. We started writing riffs and songs and all that, and sometimes there's this initial phase where we struggle a little bit to come up with really meaningful stuff, and then we'll go through it and all of a sudden, this wave of ideas comes crashing in, and that's what we're getting into right now. We're just getting warmed up, so to say. We're not constantly writing. We usually have a different approach. We sort of set time aside and then really get into it and lock the doors and don't wanna be disturbed and eventually we'll come out with an album. But it's not like we're constantly writing on the road, and every other day we have a new riff and always collect ideas. It doesn't work that way for us, for some reason. We're different." Wolf: "Actually, 'Blind Rage' wasn't too bad. It was the album before, 'Stalingrad', where we were really striggling with the time, because we had already committed to a tour and time was running out and we had to get this album finished no matter what, and that was tough. 'Blind Rage' wasn't so bad — we actually had enough time — and we wanna make sure we have enough time this time as well. Because what happens is you get so deep into the writing process that you lose objectivity very easily, and everybody knows what. But it's great comfort to just sort of let songs simmer for a while and not listen to them for a week or two and then go back to them and think, like, 'Oh, this is really good,' or, 'Oh, this is terrible,' with fresh eyes, or ears rather." Wolf: "We always try to write what fans wanna hear from ACCEPT. At the end of the day, our criterion is always, 'Is this really ACCEPT or is this just something that we like?' 'Cause a lot of times we'll write stuff and I think it's good and I love it personally, but at the same time I know it's not quite right for ACCEPT stylistically, and it sounds maybe like somebody else too much, or it may be a little bit too off course, and we toss it aside. And you have to be brutally honest. At the end of the day, we're making music for the fans and not just to satisfy us. I mean, we're never gonna make a jazz album just because we feel like it. Not that we could, but even if we could, we wouldn't do it." Wolf: "Not at all, because the solo stuff that I'm doing is all based on classical music. Just like the first album that I did, it's all existing classical melodies that I just metal up and just sort of rearrange as metal instrumentls. One has really nothing to do with the other, and there's no overlap. And I've never felt like I have a ton of ideas that I couldn't use with ACCEPT, because Peter [Baltes, bass] and I, we are the heart of the band, and everything we wanna out out, we do. If it's right for the band, we will, but there's not a ton of… You know, I don't have any other side projects other than this classical thing. [But the new solo album] is actually in the can, it's delivered to the label [Nuclear Blast], and it will see the light of day sometime this year, probably towards the summer. This new one will actually be a lot more metal than the first one I made, which was more of a studio production, no strings, and not as big of a production as this one. It will maybe even surprise a few people how heavy it is. And even though it's classical music, yeah, but some of it is quite heavy, yeah."